You're all incredible - A heartfelt thank you to everyone involved in the 2018 Christmas Fayre on 10/11/18at St Marys Parish Centre, Alverstoke as an amazing £1133.18 was raised. It was lovely to see so many new and familiar faces at the fayre including new volunteers Kelly & Finley volunteering as a family helping on the 'Christmas table' and buying several things themselves! CP branded merchandise is always popular, and there'll be some happy cats given the sales of catnip mice. The chocolate tombola run by Ann & Heather was popular and lots of sweet prizes handed out. More sweet treats on offer with tea and cake from the refreshments team, a special thank you to Toni for baking a yummy selection of cakes including CP cupcakes. As well as books, bric a brac, craft and gift items we had a large range of brand new puzzles so there was something for everyone. Huge thanks to everyone who donated, baked, transported, bought, helped and generally contributed in so many ways to the success of the Christmas Fayre. 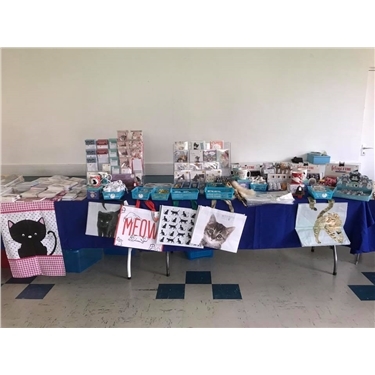 All this fabulous fundraising enables our volunteers to continue helping needy and unwanted cats, supporting owners with subsidised neutering and microchipping campaigns and through our Lost & Found service. Your support helps Gosport CP make a practical and positive difference to the well being of cats.